Anchor Financial Group proudly provides families in its surrounding community and throughout Virginia with the opportunity to have their child's ID's package completed for their records. We work with a local business, nonprofit groups or events and provide families with an electronic ID card complete with pictures, fingerprints, basic build and information about the child and the parents. We also include information pertinent to college planning with several ways that each family can plan with your specific needs in mind for college for their children. 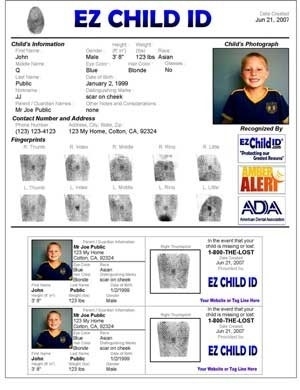 Contact us today to find out when our next Child ID event is scheduled near you. If you are a business/organization that would like us to schedule an event with you, please contact us.